You might have heard the saying: there’s an app for that. When it comes to apps for learning the piano, the options can feel endless. Here’s a summary of some of the best apps available that your kids enjoy using. The use of smartphones and iPads has skyrocketing during the last decade. With that, apps for learning to play musical instruments are becoming more and more common. As someone who learned piano as an older child, I would have given anything to have access to the sorts of apps children have available today. That being said, while apps can make learning to play the piano seem easy, one app doesn’t necessarily fit all. It’s important to understand what sort of piano player your child is before selecting the app that’s right for them. If you haven’t already, take some time to read my article on Before Your Child Learns To Play Piano here. 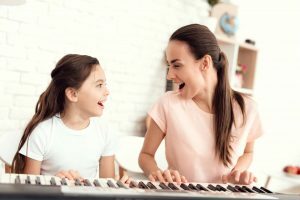 Once you’ve got a sense of your child’s musical and learning style, you can review the apps listed below to help you make the best choice. Since its release in 2016, Roland Piano Partner 2 has gained positive reviews from industry specialists due to its multi-faceted functionality. Free on both iOS and Android devices, the app works with any Roland piano that’s Bluetooth enabled. Not only does it provide an interactive way for your child to learn, it also unlocks additional features such as an enhanced user interface for your piano. Acting as a remote controller for your piano, it allows you to adjust settings and select instrumentation from your device. In terms of its learning potential, the app has many on board songs that come complete with notation for your child to learn and play along to. Build your child’s note recognition with the flash cards, or let them loose on the rhythm section, which gives them an entertaining selection of beats to play along with while showing them what they’re playing in real-time. It also comes with a Recorder and Diary function, so you can play back and evaluate your performances and keep track of your practice sessions. Piano Every Day is another Roland app and I’m mentioning it here because it’s a great next step for more advanced learners or older children (as well as adults who it is primarily targeted to). Available on iOS and Android, it was created to suit the Roland LX700, but can be used with other pianos. If you use it with the LX700 you’ll enjoy the added benefit of being able to challenge yourself to learn the on board songs. Like Roland Piano Partner 2, it also comes with a recording and tracking capability so you can keep updated on your progress. The real benefit of this more adult app is that it connects to Sheet Music Direct, which is the world’s largest collection of online sheet music. You can browse a huge range of classical and pop music songs and view the music scores. Simply Piano was chosen as one of the best iPhone apps for 2016. This easy-to-use app works with any piano or keyboard, plus it’s great for beginners and assumes no previous knowledge. It takes you through the basics step-by-step, from reading music to learning to play with both hands. In terms of the songs available to learn, it gives you access to a broad selection of popular and classic pieces to suit all musical tastes and playing levels. Your child can slow down the pace of the songs while they are learning, plus it offers personalised 5-minute workouts, which are great for children with short attention spans. 2 free courses before you are required to subscribe. Subscriptions are reasonable with a yearly subscription working out at around $10 a month. The Melodics app is a great choice for older children who prefer contemporary music, have a good ear, and aren’t keen to learn to read sheet music. So if your son or daughter wants to be the next John Legend or Lady Gaga, Melodics may be a good app to try. It’s a desktop app only, designed to be used with a MIDI keyboard. This won’t suit everyone, but chances are if your child is into the contemporary music scene, this is a good direction for them to go in. While it won’t teach your child sheet music, the app offers structured learning for ongoing progress. You get a lot for the initial free download including 60 free lessons and if you subscribe, they make it worth the extra investment with exclusive lessons from acclaimed artists. Yousician is a great all-round app available on all platforms (iOS, Android, Windows and macOS). Primary aged and older children will be attracted to this app. The visual interface makes reading music easy with the hybrid, colour-coded notation. There are thousands of songs, exercises and teacher-crafted lessons on offer, with step-by-step video tutorials for those who need it. The app also has the ability to listen to you play and gives you instant feedback. Plus, you can compete with millions of others in Weekly Challenges for a truly interactive experience. Yousician is one of the more expensive apps on offer. It has annual plans ranging from $120 to over $180 for the premium plan (USD). It’s well regarded though, with a broad following including self-learners as well as educators and teachers who incorporate Yousician into their lessons. The app gives you the opportunity to try the premium version for free for two weeks, so it’s worth a try if you think it might suit your child. There’s no harm in trying a number of different apps for your child before deciding on the best one. All the options listed above offer either a free trial or free course material before you are required to commit to monthly or yearly subscriptions, or to pay a premium fee. In some cases, you might find that there are a couple of worthwhile apps for learning piano that offer different benefits (or perhaps your child simply enjoys the variety). Whichever option you choose, have fun! Belinda is a pianist, songwriter and singer who performs in a cover band whenever the opportunity allows. By day, she writes professionally as a marketing copywriter and fiction author. She enjoys nothing better than combining her love for music and love for words.